CBD Oil For Pets with 150 mg of Cannabidiol (CBD), Organic Extra Virgin Olive Oil, Phytocannabinoid Hemp Extract, and GG BioEnhanced Complex™. 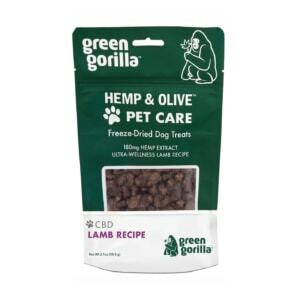 HEMP & OLIVE™ FREEZE- DRIED DOG TREAT 180MG 2.1 OZ Available in 2.1oz. (59.5g) bags Flavor: Lamb 180mg of active CBD in the whole bag Approx. 3mg Active Cannabidiol (CBD) per nibblet We suggest a minimum of 1 nibblet daily per every 10lbs Contains no THC Ingredients: Lamb, Lamb Liver, Certified Organic Extra Virgin Olive Oil, Phytocannabinoid Hemp Extract, GG BioEnhanced Complex™ (Organic Turmeric Root Extract, Organic Rosemary Leaf Extract, Organic Soy Lecithin), Mixed Tocopherols). 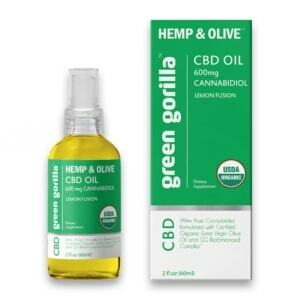 Hemp & Olive Whole Plant Full-Spectrum CBD Oil – 3000 mg Green Gorilla’s flagship line, Hemp & Olive, brings you the world’s highest quality CBD Oil. Available in 2fl oz. (60ml) bottles. Each pump of delivers : 20mg of hemp extract oil / 5mg of active CBD. 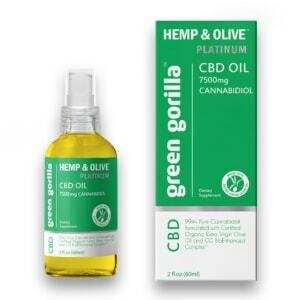 Suggested Use for the Whole Plant CBD Oil – 3000 mg: 5 pumps per day. 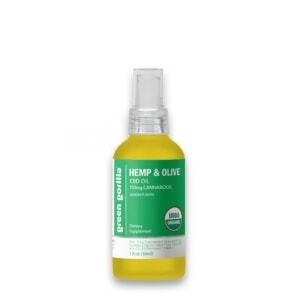 Ingredients: Organic Extra Virgin Olive Oil, Phytocannabinoid Rich Hemp Extract (aerial parts), GG BioEnhanced Complex™(Certified Organic Tumeric Root Extract, Certified Organic Rosemary Leaf Extract, Certified Organic Lecithin). Botanical CBD Balm with 300 mg of Cannabidiol (CBD), eucalyptus, lavender, cypress oils, and rosemary oils to help soothe and calm. CBD Lip Balm with 20 mg of Cannabidiol (CBD), crafted with plant-based ingredients that are packed with antioxidants, flavonoids and other vitamins. CBD Oil For Pets with 600 mg of Cannabidiol (CBD), Organic Extra Virgin Olive Oil, Phytocannabinoid Hemp Extract, and GG BioEnhanced Complex™. ORGANIC – Made with 95% organic ingredients. NON-GMO – Made without genetically engineered ingredients. CBD Oil For Pets with 1500 mg of Cannabidiol (CBD), Organic Extra Virgin Olive Oil, Phytocannabinoid Hemp Extract, and GG BioEnhanced Complex™. Our classic 1500mg Pure CBD + our high quality 1200mg Whole Plant Full Spectrum. Our delicious 600mg lemon infused CBD + our luxurious 300mg botanical balm. 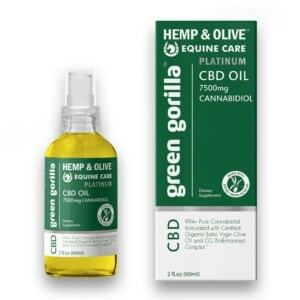 This 1 ml Glass Dropper add-on accessory fits all 1 fl oz Pure CBD Oil’s, 1 fl oz Full-Spectrum CBD Oil’s, 1 fl oz CBD Oil For Pets, and 1 fl oz CBD Oil For Horses. This 1 ml Glass Dropper add-on accessory fits all 2 fl oz Pure CBD Oil’s, 2 fl oz Full-Spectrum CBD Oil’s, 2 fl oz CBD Oil For Pets, and 2 fl oz CBD Oil For Horses. Our freeze-dried dog treats + our luxurious 300mg botanical balm + our classic 150mg Pure CBD.